I started painting surfboards back in 1998 while I was still in college. I was ordering my personal boards from a local shaper from Puerto Rico who’s now a very good friend of mine. I painted the first board he shaped for me and that led me to paint his team rider’s boards. Soon, the regular customer base jumped in as well. 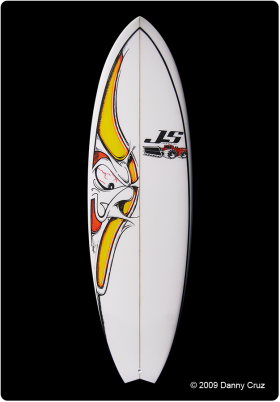 This creation is a JS Industries Sonic Fish that I painted for myself in September 2009. The artwork is done with Uni Posca paint markers right over the final glassing. Once finished, I spray a protective coating over the artwork in order to protect it. This one turned out amazing, but after surfing the board I found it to be too big for me. It went back to Surf Ride surf shop and eventually got sold. My biggest inspiration when it comes to surfboard art is master surf artist Drew Brophy. Check out his amazing work at drewbrophy.com.